FIRST of all (see what I did there? First? Like the theme?) I wanted to tell you about something my husband made up* that we do at home now whenever we’re telling a story and we realize that it’s just not as interesting or funny as we thought it was going to be. When we realize it’s falling flat, we end it there by saying, “And then I found five dollars!” because then it gets to end on an exciting note. I wanted to tell you about that just in case any other storytellers wanted to employ that technique. So what I’m really going to tell you about tonight is a story about my first car. It wasn’t my favorite car. My absolute favorite car was my second car, a seatbelt-less push-button transmission 1963 white Dodge Dart. 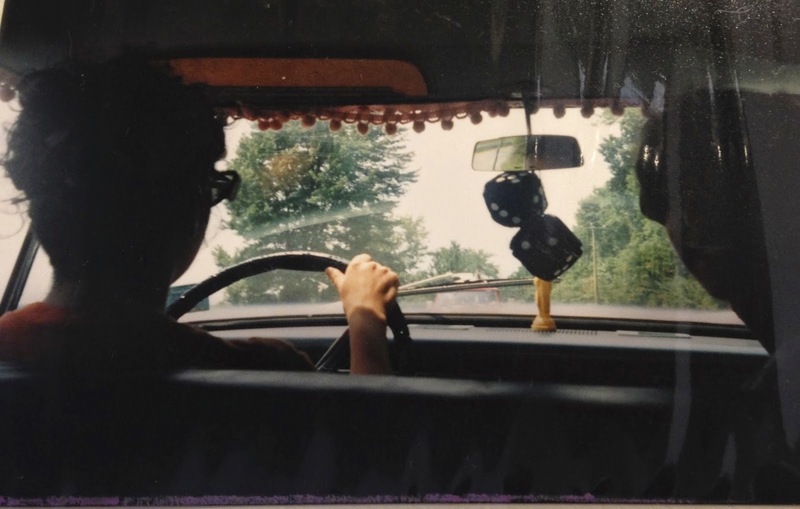 I had spray painted silver stars on the doors, which made some people wonder if it was an old Police car, and I had hung little pink pom-poms from the ceiling, which made other people wonder if they had seen it in a Cheech and Chong movie. As far as I know, it was neither of those things. But I'm not telling you about that car tonight. I'm not telling you about. 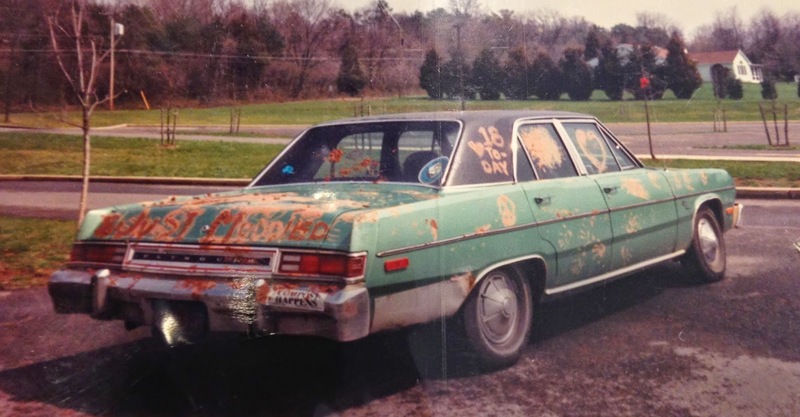 It was pretty funny that my first car was green because there was story from when I was young that my parents were buying a used car, I think a Chevy Nova. I asked what color it was and when they told me it was green I cried because, “Nobody wants a green car! Who wants a green car?” Apparently 17 year old me wanted a green car because it was for sale and it was really cheap. It was originally my high school boyfriend’s family car and then it belonged to his sister and then to him. Then his parents purchased him a brand-new Toyota pick up truck and sold the Green Monster to me for $200 of my hard earned babysitting money. The first person to give it that name was a local woman that probably supplied most of that $200 for babysitting her daughter. It sort of backfired because when I had to drive her daughter to swim lessons, the poor girl was afraid to get in the car since she had heard it was a monster. Having a car my senior year of High School was awesome. It meant I didn’t have take the bus or bum a ride off of anybody. And I could leave early or go get something to eat at a restaurant--which you weren't supposed to do unless you had a pink slip from the office. What I did have was a pad of paper that was pink and approximately the same size and shade as the pink slips from the office. So what I would do is I’d scan the parking lot to see where the attendant was and I’d walk on the complete opposite side of the parking lot from him, waving my pink paper. He’d wave back and let me go on my merry way. By my 18th birthday I no longer had the boyfriend but I still had the Green Monster! I was so excited to finally be able to take advantage of the “free car wash on your birthday” deal offered at Shammy Shine. There had been some spring showers the previous week so my car really wasn’t that dirty. But because there were showers there were also plenty of mud puddles. So my new boyfriend, one of my best friends (and now husband) and his girlfriend and I spent some time writing on my car with mud to make my free car wash really worth it. 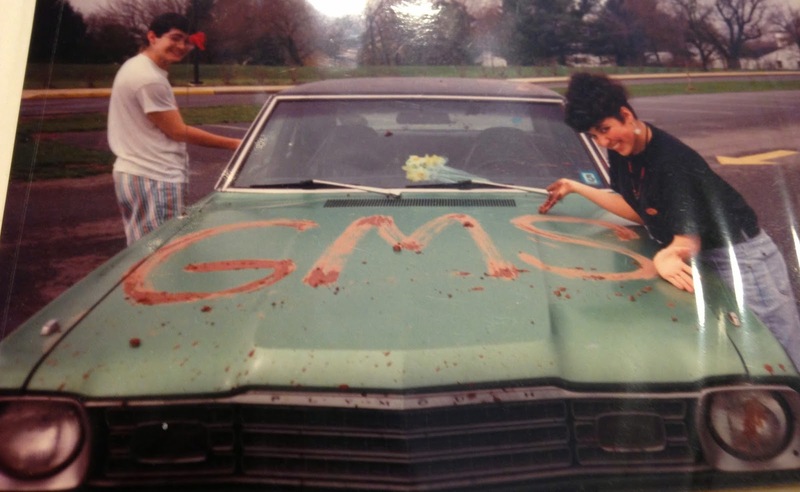 We wrote things like “18th Birthday” and “Just Muddied.” I felt bad when we go there and realized laborers had to manually wash it off first, I thought I was just going to get to go through the magic car washing machine. Not my first boyfriend or my second boyfriend but eventually my husband. One of the last days of senior year there was a party at a friend’s house after school. My friend Tempe and I went to pick up some pizza at the pizzeria across from the A & P in Clinton. After we got the pies, I started to turn left onto Old Route 22 at the same time that the LINK** bus began to turn left from the A&P parking lot on the other side of the road. Now, technically, I think there would have been enough room for us to pass by each other—however; the Green Monster had picked up this cute habit of letting the passenger side door frequently fly open when making a turn. We hit the LINK. Well. I mean…it was a piece of junk. But it was my piece of junk and we were two cute high school girls in our first fender bender. He could have been a little nicer. Not long after I left to college the Green Monster's transmission crapped out and she headed up to that to that great automobile recycling center in the sky (also known as Cozze’s junkyard on Race Street in Pittstown). And then I found five dollars. The Green Monster might not have been my favorite car but as my first car it will always hold a special place I my heart. It was my first ticket to independence, freedom and adventure. 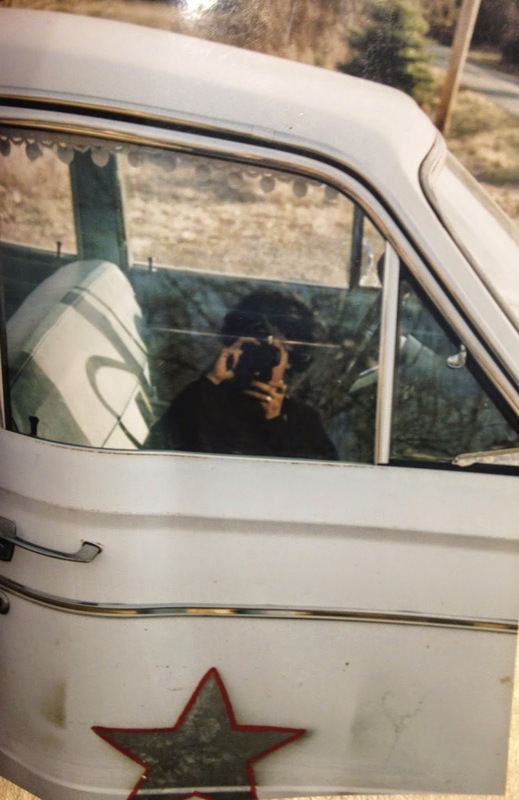 And, with its old-fashioned ways like actual switches and knobs, windows you had to roll down manually, terrible handling and a foot pedal to operate the high beams, it prepared me for my second and absolutely favorite car, Betsy. But I'm not telling you about that car tonight. I love me some old fashioned car features! *After I publicly told this story he told me he didn't actually make it up. He thought I knew that. I didn't. Whoops.